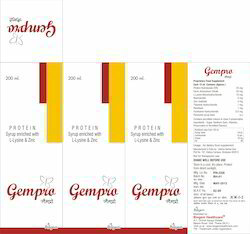 We offer high quality range of Protein Supplements such as Protein Syrup (Gempro 200ML), Protein Supplement and Protein Powder. We offer our range at market leading prices. These products are made with the best composition under keen observation of our experienced staff and hence are quality assured. Our clients can avail from us an effective range of Protein and B Complex Syrup. It is formulated under the strict surveillance of expert professionals using high quality ingredients. Post formulation, this syrup is tested on certain well defined parameters of quality to ensure its effectiveness. Customers can avail from us an effective and qualitative array of Protein Powders. Processed using high quality ingredients, offered range are in tandem with medical industry standards. To cater to the diverse requirements of customers, we offer this protein powder in packs of different quantities. Looking for Protein Supplements ?